Lock & Load! This stage 1 kit provide a big increase in horsepower and torque simplified into an easy package. Tuning and clutching on the XPT go together like high powered rifles and tannerite. Together they pack a huge punch for the ultimate power gains to the wheels. For tune levels 3 and up, we'd recommend a performance exhaust. Our billet diverter (blow off) valve is also recommended as it ensures no boost leak past the stock plastic one. 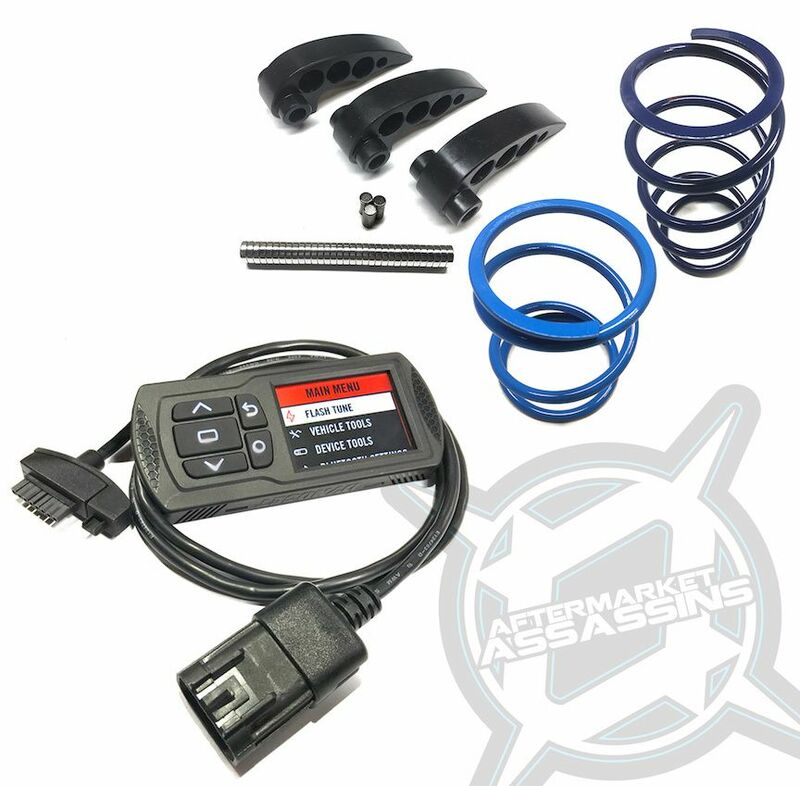 This package features AA's performance tunes loaded directly on the Powervision ECU tuner! This versatile tuner allows our tunes to easily be uploaded to your factory ECU, switch between tunes, and even return to stock. The Powervision is also a great gauge showing boost, timing and more. You can leave the Powervision hooked up for gauges, or completely remove it after flashing your ECU. The Powervision also has excellent data logging capabilities if you download the software, and use your laptop. You can even view trouble codes and erase them on the fly. We are highly experienced in tuning these RZR's and that will show. Our tunes are simply set up correctly, and everyone with a Powervision should have these tunes! They are also easily labeled and will show rough horsepower claims with supporting mods such as exhaust and clutching. These tunes modify all the necessary maps to create big horsepower, while still maintaining a reliable and safe RZR. Each tune is built specifically for your Powervision allowing us to change the tire size or fan temp if needed. This package also features our S2 or S3 clutch kit! No matter the terrain, they hit hard and just keep pulling for days. On the trail or at the race you'll notice wicked acceleration and instant clutch response when getting back into the throttle after hammering that corner. In the dunes you'll see the same benefits, but also have much less bogging when climbing that big dune. The machine will hold RPM so you can get where you need to go, and get there faster! Going mudding? Our mud setup will help turn those tires through the thick and deep with much better RPM and wheel speed that's key to climbing out of that hole. We have a huge amount of CVT knowledge, a great passion for the sport, and spent many hours testing different setups in the real world. We know you'll be extremely pleased with the performance gain from our clutch kits! The S2 includes helix and both springs while the S3 adds the performance angle or high load angle helix. Please see clutch kit descriptions under those specific items for more details on what kit to go with. All level tunes feature: Throttle by wire limiters disabled, No overboost code, Fan on/off temp lowered to 185 degrees Fahrenheit, Seatbelt limiter disabled, Speed limiter removed in low and high gears, Rev limit at a safe 9200rpm, more throttle in low gear, better throttle response, and much more! 1 tune is included in the price. We would recommend going with 2 tunes, especially if you choose level 3 or higher. Level 5: get ready to drop the hammer! If you don't like to lose races, this tune is your friend.... and If you're friends don't like to lose either... they might not be your friends for long. This tune is developed for 110 octane fuel (unleaded is recommended if you are keeping you plan on running your o2 sensor) and really hits hard. This tune runs around 18-18.5 max psi. This is where we found the turbo to max out for the most part, so we went to our timing tables and did some work. Adding a revised timing curve with these boost pressures is a recipe for absolutely stupid power that hits harder than you can imagine. Waste gat rod adjustment is needed for maximum gains. Exhaust and clutching are needed with this tune. Billet BOV is also recommended. Max boost levels are listed as reference only. Altitude, temperature, charge temps, intercooler temps and many other conditions play into a factor of final boost output. AA tunes do a better job of making sure you reach these levels as the factory tunes are overly safe. Why our tunes over the dynojet tunes? This really depends on our tune level. The great thing with our tunes is they are easily labeled, list boost numbers, and rough horsepower gains. They have been proven to make and hold power longer than the dynojet tunes. Not only this, but we test with clutching, exhaust, and other parts to ensure our tunes work well with all factors. Lower level tunes(1-2) are actually much safer than a dynojet "max boost" tune especially if running stock exhaust, yet deliver more power than their low boost tunes. Safer tunes will hold power longer, and be much easier on your motor. When your RZR detunes because boost is too high for the modifications or fuel, it can become slower than stock! Our level 3 tune has higher boost, and comes on harder. Our level 4 tune and up are adding in race fuel and will offer even more power than any dynojet tune. Since we have so much time on RZR's, we know the limits and can push the limiters further giving you higher speed limits, and many other things hidden in our maps. Everything is taken care of for you, ensuring you have the best tune(s) out there... that should be worth every penny!